Populations of green sea turtles living in the eastern region of the Pacific Ocean have rebounded in recent years, but their numbers remain dangerously depleted. Research by led by biologists at the University of California San Diego and NOAA’s National Marine Fisheries Service is offering previously unknown information about where these turtles live and how they use their habitats, key data that will aid future conservation efforts. Cali Turner Tomaszewicz, a former graduate student and now a postdoctoral researcher in Associate Professor Carolyn Kurle’s laboratory, led the study with new technologies developed to extract life history information from sea turtle bones. Cali Turner Tomaszewicz inspects a green sea turtle bone. East Pacific green sea turtles are born in Mexico and spend their lives in the waters along Mexico and the United States, including off the coast of San Diego and in San Diego Bay. Using a technique recently developed by Turner Tomaszewicz, the researchers analyzed the bones of dead green sea turtles washed ashore along the Baja California peninsula. The approach combines bone dating, or “skeletochronology,” and the sequential sampling of annual growth rings for chemical signatures (stable carbon and nitrogen isotope ratios). The signatures in the growth rings revealed the animal’s foraging habits through its life span, not unlike extracting the life history from tree rings. These and complimentary techniques allowed the researchers to reconstruct a multi-year analysis of past green sea turtle residency patterns, demographics and ecological information. 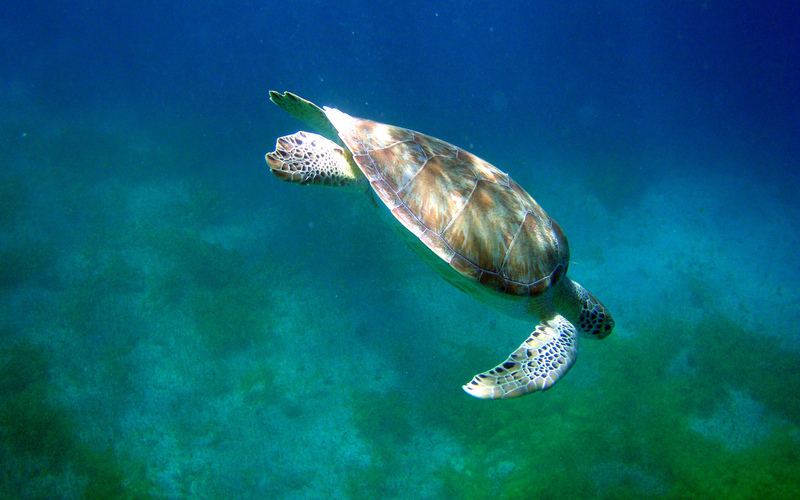 The results, published in the journal Marine Ecology Progress Series, answer vital, previously unknown aspects of the green sea turtles’ habitats, including their age when they move into nearshore habitats, when they start breeding and whether they use nearshore or deeper habitats for feeding. According to the researchers, the new insights about the life-history of green sea turtles in this region have strong applications to the conservation, management and ongoing recovery of this endangered population. Signature growth layers in East Pacific green sea turtle bones allowed researchers to study the animal’s foraging habits. The analysis shows that these green sea turtles spend approximately three to five years as juveniles in the open ocean before settling in nearshore habitats. Smaller turtles at the population’s mainland nesting sites mature and begin breeding at 17 years of age, while larger turtles nesting on the island rookeries begin breeding at 30 years. Most importantly, the data revealed that these turtles spend most of their time eating in the offshore waters of the Gulf of Ulloa, directly adjacent to the beach where they were found dead. The finding, a surprise to the researchers, carries critical conservation implications since the turtles’ cause of death is presumed to be from being caught in nets (bycatch) from fishing boats in the Gulf of Ulloa. Cali Turner Tomaszewicz in Baja California with an East Pacific green sea turtle. Offshore, it’s likely the turtles consume red crabs, squid and discarded fish, rather than the invertebrates, macroalgae and seagrass typically eaten by green turtles in nearshore habitats. “This more carnivorous diet likely helps these turtles grow faster and mature sooner, yet also comes with the tradeoff for being more at risk of becoming fisheries bycatch,” said Turner Tomaszewicz. The researchers previously applied their novel technique to North Pacific loggerhead turtles (Turner Tomaszewicz et al. 2015, 2017) and now intend to apply their methods to investigate other turtle populations throughout the Pacific. Coauthors of the research include Jeffrey Seminoff of NOAA’s Southwest Fisheries Science Center, Larisa Avens and Lisa Goshe of NOAA’s Southeast Fisheries Science Center, Juan Rguez-Baron of the University of North Carolina Wilmington and S. Hoyt Peckham of Stanford University. The research was supported by NOAA Fisheries, UC San Diego, National Institutes of Health (T32 GM007240 Cell and Molecular Genetics Training Program), UC-MEXUS Dissertation Grant, ARCS Foundation Scholarship and a Jeanne Messier Memorial Fellowship.